Last night was the second installment of the $500 dollar a plate ($1000.00 for V.I.P seating) 24th GLAAD Media Awards held at the JW Marriott in Los Angeles, CA. 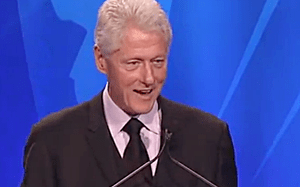 former President Bill Clinton was the “star attraction” and the controversial recipient of the Advocate for Change Award. And during his speech once again Clinton did not mention his role in signing DOMA and DADT into law, nor did he apologize for it. Instead he gave the credit of his “evolution” on LGBT equality to his daughter, Chelsea Clinton who made a surprise appearance after his speech to present him the award. And while Clinton ignored all responsibility for both DOMA and DADT he talked about his present support that DOMA be struck down. Presenting Clinton with this award has only further cemented the evolution of GLAAD (the organization formerly known as Gay & Lesbian Alliance Against Defamation) march into irrelevancy. It’s become apparent to everyone that the awards are not based on merit but on name recognition and draw. At the first installment of this years awards GLAAD awarded Brett Ratner its “Straight Ally of the Year” who in 2012 was fired resigned from producing the Academy Awards after telling an audience that “rehearsing is for fags.”, and then quickly apologized and worked with GLAAD making a celebrity studded “Coming Out for Equality PSA” series not for actually being a selfless straight ally. And as much as I live Hillary Clinton as for Bill he sold our community out, to The Right Wing, for a few votes bragged about it and never apologized. The GLAAD Media Awards are a joke, a sham and just further proof of Gay Inc’s elitism and its greed. After last night Vito Russo (GLAAD’s founder) is spinning in his grave, no doubt.